Control of access to content has become a vital aspect of many business models for modern broadcasting and online services. Using the example of digital broadcasting, the author reveals the resulting challenges for competition, broadcasting, and telecommunications. 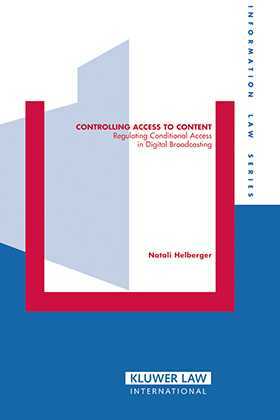 Controlling Access to Content explores the relationship between electronic access control, freedom of expression and functioning competition. It scrutinizes the interplay between law and technique, and the ways in which broadcasting, telecommunications, and general competition law are inevitably interconnected. European law has widely harmonised the way conditional access is regulated in the Member States of the European Union. The author comments in detail on the relevant rules in European Court of Justice and the European Commission in its function as watchdog of European competition law. The relevant provisions in European broadcasting law, such as the right to short reporting and the so-called list of important events, are discussed extensively, as are the conditions that overrule the free-TV culture that was the essence of traditional broadcasting law. The broad and systematic screening of the existing regulatory framework makes this book an essential resource for all those who are concerned with the electronic control of access to content. With its in-depth analysis and explicit conclusions, Controlling Access to Content amply supplies the crucial understanding of this complex field that policy makers, regulators, and academics require. It investigates the implications of electronic access control, digitalization, and convergence for broadcasting, as well as the effects of the regulatory framework on innovation, competition, and consumer access to content. It demonstrates clearly at which points the chosen approach could backfire and generate undesirable side-effects, and what lessons can be learned from the pay-TV case for other digital service sectors. Using many examples, the author explains for lawyers, consumer and industry representatives the main lines of the regulatory framework that apply to access-controlled broadcasting, how their interests are affected, and what changes the future might bring. Table of contents: Preface. Chapter 1. Controlling Access to Content. Chapter 2. Access-Controlled Broadcasting and the Free Flow of Information. Chapter 3. Conditional Access and General Competition Law. Chapter 4. Conditional Access and Telecommunications Law. Chapter 5. Summary and Conclusion. Bibliography. Index.